‘My students are always successful. They learn the basics with me and then return later for the exam. That is a particularly difficult challenge’. 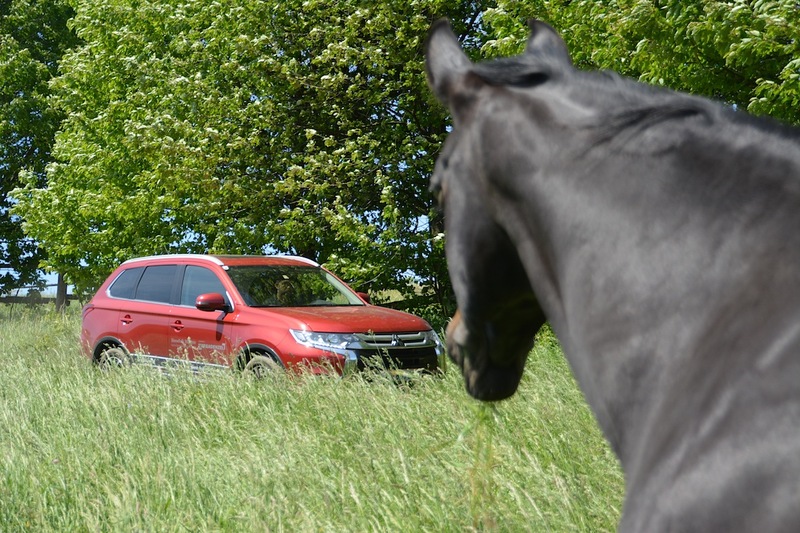 HorseFolk was visiting the German Eventer, Andreas Ostholt, at home in Warendorf after having achieved second place at Mitsubishi Motors Badminton Horse Trials. ‘Weißbier and Kaiserschmarrn’ says Andreas Ostholt as he speaks to Radio Allgäu on the phone in response to a question. They are not only interested in him as a rider – his wife is from the region. Reflecting the interviewer’s pronunciation his greetings and answers sound strange here in Münsterland, Nordrhein Westfalen. If one had to describe Andreas with only one word it would probably be ‘direct’. ‘I like to follow a straight line’, he had said earlier in the day. Having spent the morning with his son, Ludwig, he had then cycled to the barracks, where, just behind the stables of the Bundeswehr Sports School he keeps his red truck. ‘We are accustomed to living in here for tournaments – there is plenty of space for the three of us – Ludwig, Sabrina and I,’ underlining how important to him it is to have his family close by. He quickly shaves in the bathroom of the red truck and a grey-blue suit is hanging unworn. Ostholt had bought it especially for Hans Günter Winklers birthday parade in Aachen, but will have to miss out. He and his Olympic horse, So is Et, will be warming up before the dressage stage of the Nations Cup – the team has just been announced at the CHIO Aachen. Andreas was sad, ‘I was certainly excited to be selected as the fourth member of the team, but it has meant that I am unable to attend the reception’. He was to have accompanied Hans Günter, ‘…..as his foster son, it is unfortunate – I had been looking forward to it’. He zips his boots up. His groom, Sandra, presents So is Et ready saddled. ‘So is Et’s good character and relaxed nature have always fascinated me. He is just so comfortable with himself – he has a clear, untroubled gaze and would come into my bed if asked. He is a prime example of a well-schooled horse’. Soey, as he is affectionately known, has been training with Ostholt since he was four and, as with his rider, has always wanted to strive for perfection. ‘He is never spectacular’. Are you joking? You cannot be serious – he can be quite spectacular. 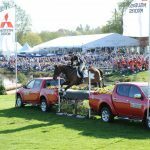 The Vicarage Vee at Mitsubishi Motors Badminton Horse Trials 2016 would be a case in point. Stumbling upon landing and then managing to find his feet – the German team vet, could not believe his eyes. Again and again when analysing the video he said that anatomically this should not be possible. That Ostholt himself did not fall, he later commented was due to ‘good saddle, good seat position’. That particular obstacle has no line, neither a base nor topline, and includes a trench – only at Badminton would it be possible. Again it proved to be a key element of the 4* versatility classic. Ostholt says that he just thought ‘not today, not today’, and Soey mastered the hair-raising situation with incredible skill. ‘He galloped onwards and I was the most relieved person in the world’. With a score of 43.4 the pair rode into second place behind Michael Jung. Meanwhile, Andreas is trotting Soey through the lush green waves of grass between the arenas. He is chatting – offering words of encouragement and praise. Soey is an entirely good natured being and always does his job well. ‘He began competing in championships at seven years old and had the ability to finish in the top ten’. This small Westfalian has a unique focus and inner strength. 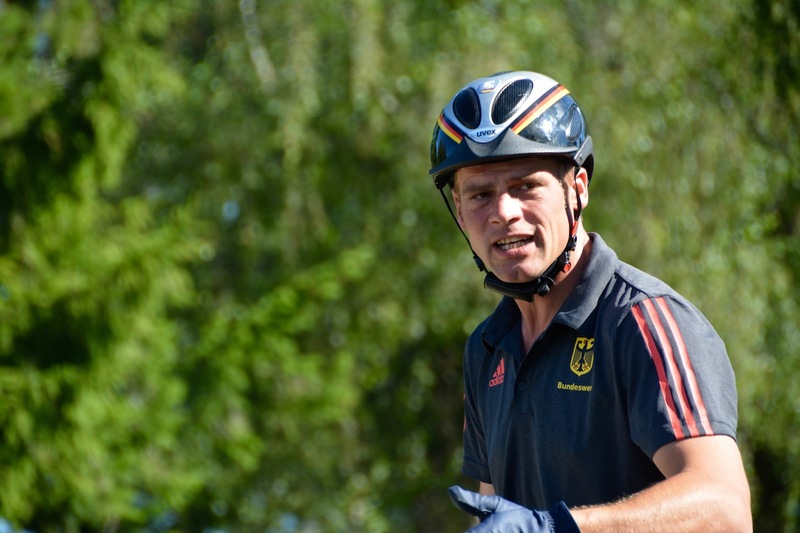 Within a few years Andreas Ostholt has helped to make the Bundeswehr Sports School the centre of excellence. Training conditions are ideal – the large arenas and the all-weather arena with its obstacles built to the highest technical standards. It is a treat to watch a delicate rider on a powerful horse casually address the ditches, ramparts and obstacles of the training. Ostholt is convinced that this course is part of the success story of German eventing, ‘and I am the happiest person here’. Since Ostholt began working at the sports school many things have changed. ‘It is no longer the preserve of the military; everyone is here because they want to be training’. The passionate rider has the backing of the Commander, allowing him to present any concerns directly to the top ranks. His superior officer, Colonel Michael Maul has said ‘We are very proud of him and his horse’. For the Bundeswehr School of Equestrian Sports this is extremely important. Ostholt is graduated with a Diploma in trainer studies from the German Sport University in Köln, and has made a special study of the psychology of training; he knows what exactly makes a powerful athlete. He sees parallels with his fellow student and Olympian, sailor Michael Fellmann. ‘Both the sailor and rider interpret the changing situation’. Sports such as swimming or running that rely on only the one athlete in a controlled environment, and can offer no comparison’ asserts Ostholt. For him an ideal athletic training regime is that of the boxer. By promoting tactics, coordination and anticipation fear can be overcome. This directly applies to eventing. Warendorf is located in the undisputed equestrian capital in the heartland of Nordrhein Westfalia. 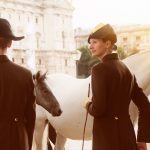 Within close proximity to the Bundeswehr Sports School are the German Equestrian Federation, the German Olympic Committee for Riding, the stud farm of the German Riding School and the Birkenhof – home of eventing legend, Hans Günter Winkler. 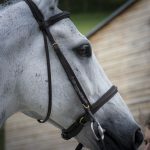 So, what about the risks of eventing as portrayed by the media? 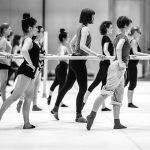 Ostholt confronts this question on the nose; ‘the horse begins with his own thoughts and attitude, but the longer you train together the more you work in unison. As a rider you prepare the horse, setting the pace, balance and tension. 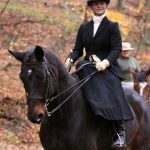 However the decision to address or refuse an obstacle always belongs to the horse. It is not just good or bad luck’. ‘Aachen is leading the way, and we have ideas for the future’. Not only does Ostholt respond to these changes, he is helping to shape them. 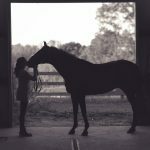 That there will always be accidents in professional sport cannot be avoided, but listening to and understanding the horse is an important part of training. ‘When he is no longer having fun he will rebel’. There is a sense of this when watching Ostholt train. We hear phrases such as; ‘let him breathe’, ’relax and think of your breathing’, ’JUMP’, ‘grip his body’, ’look forward and let go’. The success of his students – in addition to the Belgian he has also coached the Czech champion – ‘My students are always successful. They learn the basics with me and then return later for the exam. That is a particularly difficult challenge’. The phone rings – it is Radio Allgäu requesting an interview. 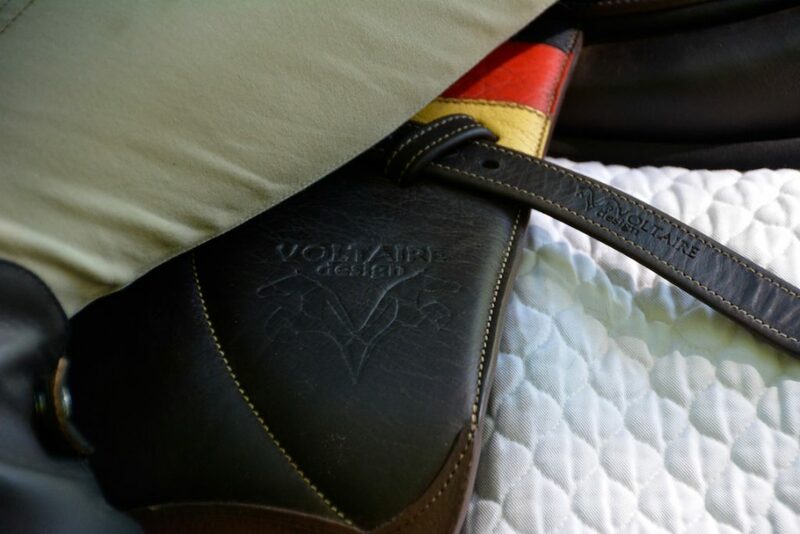 This article was created with the support of Voltaire Design – Sponsor of Andreas Ostholt and HorseFolk Magazin.